-Auto redial phone number again and again in a very easy way. 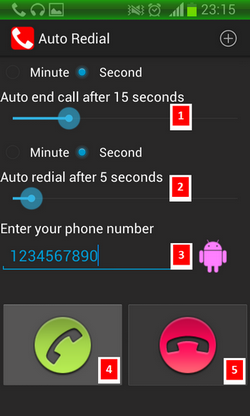 -Make your phone automatically hang up with the timer you setting. -Many network carriers offer free calls for first 5, 10, 20, x minutes. This application will help you monitor the time elapsed and manually hang-up the call. -When you run into unknown problem to cause auto hang up fail, this app will trigger a long vibrate for 3 seconds to tell you hang up phone call manually. -When the number your dialed entering voice mail, your have to wait for that longer time till call disconnect and then redial. 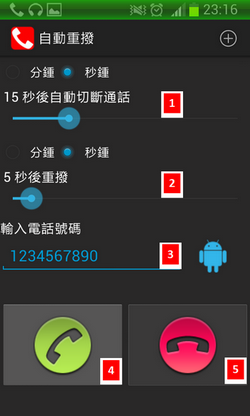 For this case, you could enable "Enable keep talking button" from Others>Setting>Advanced. 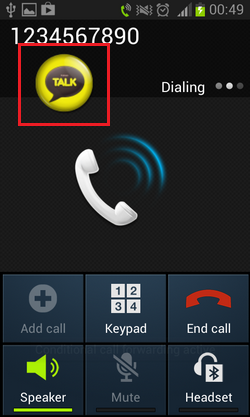 Set the proper end up time, then when call is active(that is person answer the call) then double click the yellow icon to prevent call from disconnect.